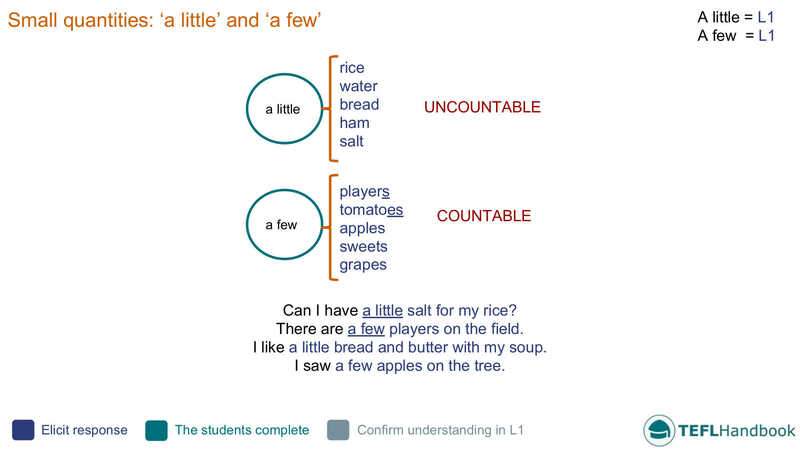 A collection of activities, games and resources that can be used as an A2 level ESL lesson plan to teach students the difference between the quantifiers 'a little' and 'a few'. This plan contains sample board work that you can use as a lead-in activity along with some fun ESL activities and games. The sample board below suggests one way that we could introduce the target language for this lesson. 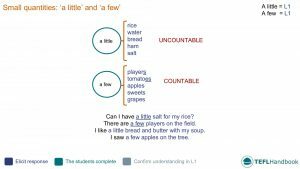 Start off by eliciting whether a little and a few are used with countable or uncountable nouns and ask for examples of nouns we use for each. After that, work with the students to build some statements. Give them the beginning of the statement and attempt to elicit the rest. If you need to bring this board into the classroom for reference, the TEFL Handbook app gives you offline access to all of the ESL resources on this site, plus a lot more. We start with a quick little ESL writing activity. The students will make sentences using a little and a few, two of each type should be enough. You could add some prompts to the board or use L1 to inspire them. This ESL writing activity challenges your students to apply the target language to some new vocabulary. Start off by teaching the meaning of the verbs fry, boil, bake, peel, chop and serve, along with any supporting vocabulary you feel is necessary. For example, frying pan, pot, plate, oven and knife. Then have the students make sentences using a little or a few with each of the verbs. They should make one sentence for each verb. As usual, we only include games that require no more than a whiteboard, markers and dice. Charades: What am I cooking? Students pretend to be a TV chef. On each turn, they will describe what they are doing while the other students try to guess what they are cooking. Demo with an assistant first, and give extra points for each correct usage of a little or a few. We hope that you were able to grab a few ideas from this lesson plan. Our suggested next lesson is on questions about the future. Be sure to check out our complete collection of elementary level lesson plans, A2 lower and A2 upper. For other levels, have a look at our entire collection of ESL lesson plans. Also, if you are an iOS or Android user, the best way to view this content is through the TEFL Handbook app. An ESL lesson planner for English teachers, designed for in-class use.